In preschool Montessori classrooms, the curriculum is displayed in an organized fashion from beginning to-end, on open shelves. The goals are there for all to see. The multi-age group, which is a critical feature of any Montessori environment, contributes to the manifestation of this principle. Younger children see the work of older children, and are therefore able to see before them longer-term objectives, demonstrated by the older children. In a positive, comfortable setting children try new things and build self-confidence. The orderly and child-centered structure of the classroom encourages children to explore, experiment and accept responsibility for the care of the environment. Multi-age grouping enables younger children to observe and learn from older children, encouraging mutual respect and cooperation in one another. 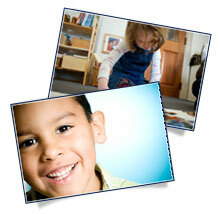 This spirit of cooperation and assistance is a fundamental principle of Montessori teachings. At Diamond Hill Montessori every part of the prepared environment presents the child with a challenge, an opportunity. Here is a skill or knowledge that is not yet possessed. In Montessori prepared environments, complex tasks are made not simple, but (with application and some effort) doable. Montessori’s principle of isolation of difficulty, which breaks complex tasks down into a series of simpler tasks, is a key. Problems are not insurmountable obstacles. They are challenges to be met, and the children learn that they can meet and overcome them.